We are giving away up to five hours of caregiving by Visiting Angels® and a case of Depend® absorbent underwear. Enter for a chance to win! We’re introducing something new and exciting in our sweepstakes this month. 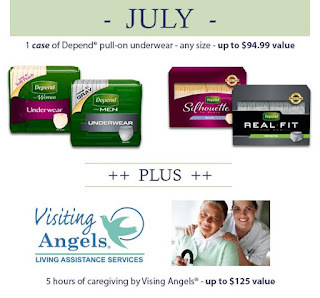 In addition to an entire case of premium-quality Depend products, one lucky winner receives up to five free hours of in-home senior care from the professional care network Visiting Angels. One case of Depend pull-on underwear: The winner gets to choose any size of Depend absorbent underwear in the new soft peach color or popular Silhouette style for women. Men get to choose any size of Depend underwear in new neutral gray or the cloth-like Real Fit underwear. This prize is valued at up to $94.99. Up to five hours of caregiving by Visiting Angels: Visiting Angels living assistance services is a national, private duty network of home care agencies. The winner receives up to five hours of in-home care — with a maximum payment of $125 — from skilled elderly-care providers from a licensed, bonded and insured agency. For a chance to win, participants need only e-mail info@caregiverpartnership.com or mail a short statement explaining these products would be useful to him or her or a loved one. We will accept entries for this prize through July 31, 2015, and will notify the drawing winner the first week of August. Visit our “Helping You Get On With Life” sweepstakes page for details.